The #1060 Miss Barbie was the very first barbie doll with open and close "sleep" eyes and the first Barbie doll with bendable legs. She was introduced in 1964. 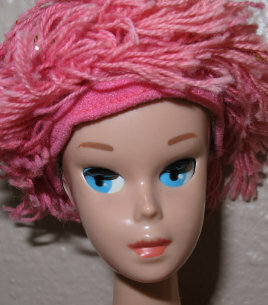 Miss Barbie's head was a brown painted hard plastic molded head for which she could wear wigs. She was the first doll to have this type of head. Her head would often have melt marks if her wigs were left on too long. She had blue Sleep style eyes and coral lips. She was on the same body as the 1st issue American Girl Barbie with the engraved intaglio markings on her bottom, rather than raised markings. Her markings read: ©1958/Mattel,Inc./U.S. Patented U.S. Pat. Pend Made In Japan. In the box was Barbie wearing her one-piece pink ruffled swim-suit (one of 3 versions), pink swimming cap with gold glitter, orange headband, and pink open-toe pumps. 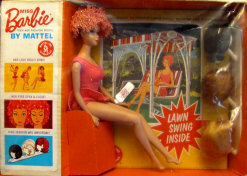 Also include were white plastic wig stand, 3 wigs (blonde pageboy, red bubblecut and brunette flip), gold wire stand, lawn swing, plant, magazine, transistor radio, purple princess phone, tray, two glasses, and booklet. This girl wasn't around to long. Kids almost seemed to be afraid of her, which made her a very poor seller. Certainly, I can see why! There are "unpainted extra heads" without bodies floating around, and these were never sold to the public. Her swimsuit actually came in three variations: pink with printed dots on the fabric, a pink suit with raised gold glitter dots and a solid pink version without any dots.